Plastic fancy bags handicraft training opening ceremony was conducted in Vocational Education Centre, Myanmar Maternal and Child Welfare Association Headquarter on 3rd September’ 2018. This training is intended for the family income programmes. The ceremony was attended by President of Myanmar Maternal and Child Welfare Association, Prof. Dr. San San Myint Aung, Treasurer Dr. Le Le Yi and Central Executive Committee member Daw Than Than Sein,IPPF Project Executive Director Dr. May Chan Oo, Myanmar Women’s Affairs Federation President and Vice President, Myanmar Women and Children Development Foundation Vice President and Secretary, Myanmar Red Cross Society Executive Committee member, Myanmar War Veterans Organization Executive Committee member, Nay Pyi Taw MCWA Supervisory Committee Chairman, District and Township MCWA Supervisory Committee Chairman, Facilitators, participant and other invited guests. 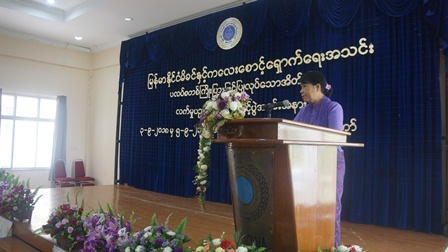 At opening ceremony, MMCWA’s President Prof. Dr. San San Myint Aung delivered opening speech. A total of (19) participant from the different Ministries of Nay Pyi Taw Territory was attending this three days training.